It’s the end of January, and I’m looking at the rest of 2013 with high hopes and some trepidation. I have some wine thoughts about the year we’ve just begun, and I’d like to share with you. -Prices of European wines to rise with the loss of recent crops due to poor weather conditions in Europe. -Increase of consumer’s awareness and desire for wines from Spain, Portugal, Argentina, Chile, Australia, New Zealand, etc. I think in the absence of a good crop, we’ll see more people trying to find what they can afford- and they will find great alternatives in quality, and hence, value. 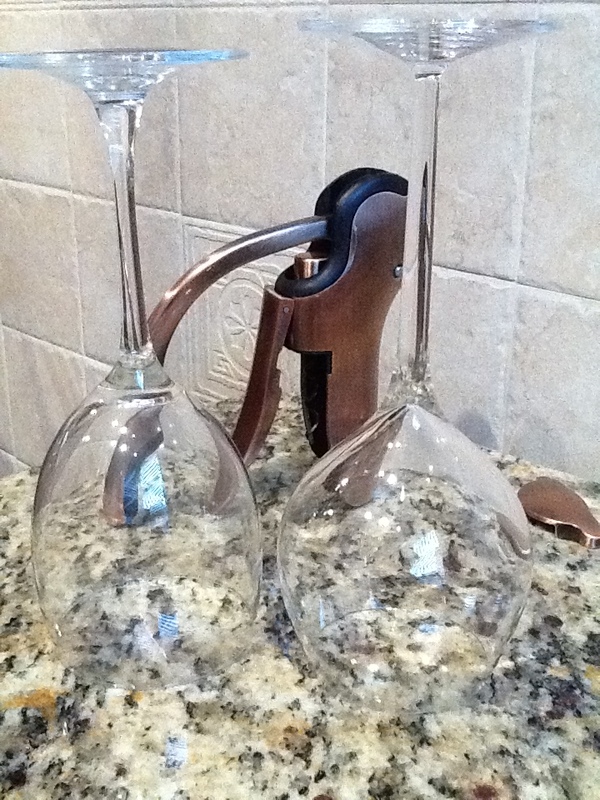 -More use of alternative wine closures. I love the increased use of synthetic corks and twist-off caps. I’ve not had a Zork in my house yet but Modus Operandi Cellars, a great, small Napa Winemaker, uses the Vino-Seal on select wines. 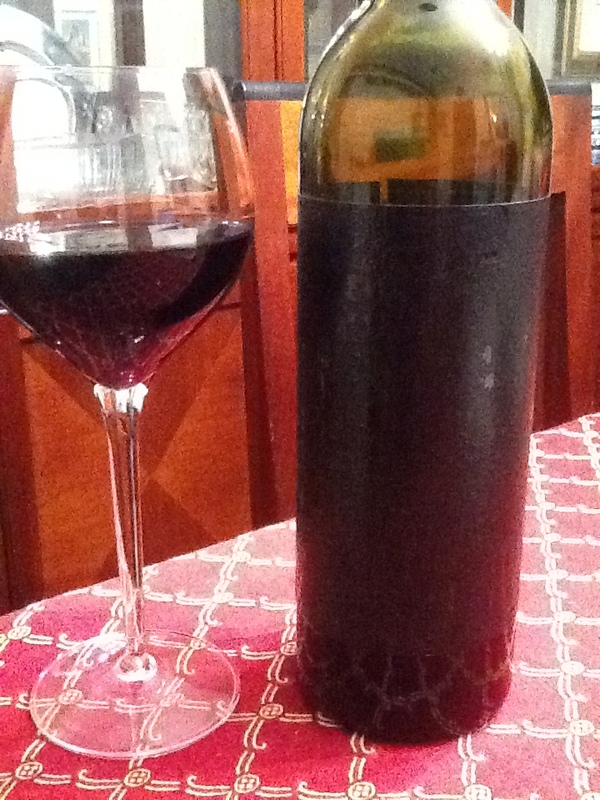 I have come to adore this closure method and want to see its success on red wines. -I’d like to see affordable high end wines get some level of aging and certification of their storage and heritage. No one wants a Kurwinian forgery, but I’m just looking for decent, good value wines with some age, depth, and structure that I can really enjoy and share with friends. Is it too much to ask for a bottle of ‘second wine’ from a top producer to have ten years of proper storage and cost under $100, with some certification? So, a toast! 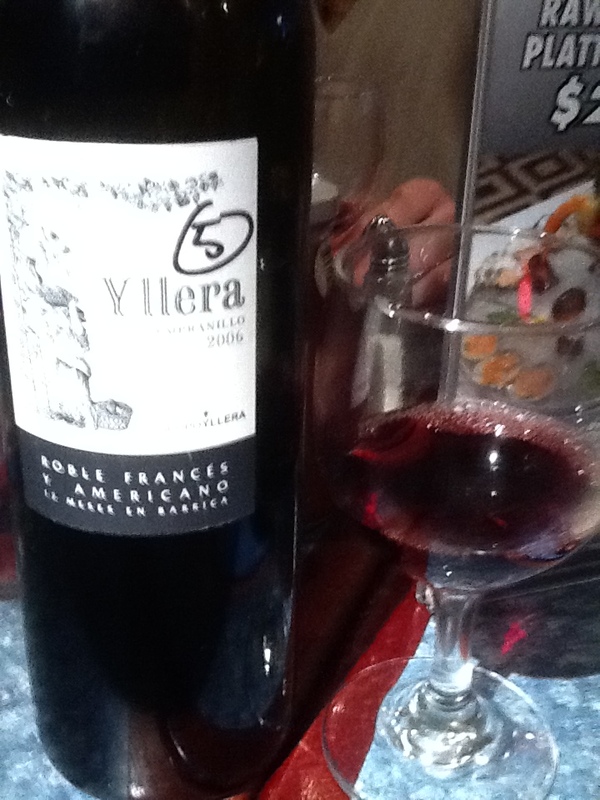 Here’s to enjoying great wine with friends in 2013. And thanks for your continued support of JvBUnCorked! Wine Around Town? In Vino Veritas! I admit I know very little about wine, but I know what I like, and the reason I know what I like is I put as many versions of the same grape in front of me and sample them all. This is what this event will do. We’ll get together and all bring a bottle of the same type of wine (merlot, syrah, pino, etc) with you. Everyone will hopefully bring wine from different vineyards and of different vintages, so we can get a large sampling. The more people come, the more wine we get to taste. And don’t feel pressure to spend lots of money: if the wine is great AND cheap, it makes it that much better a find! If you want to pair up with someone and go in on a bottle together, please do! It was quite straightforward. 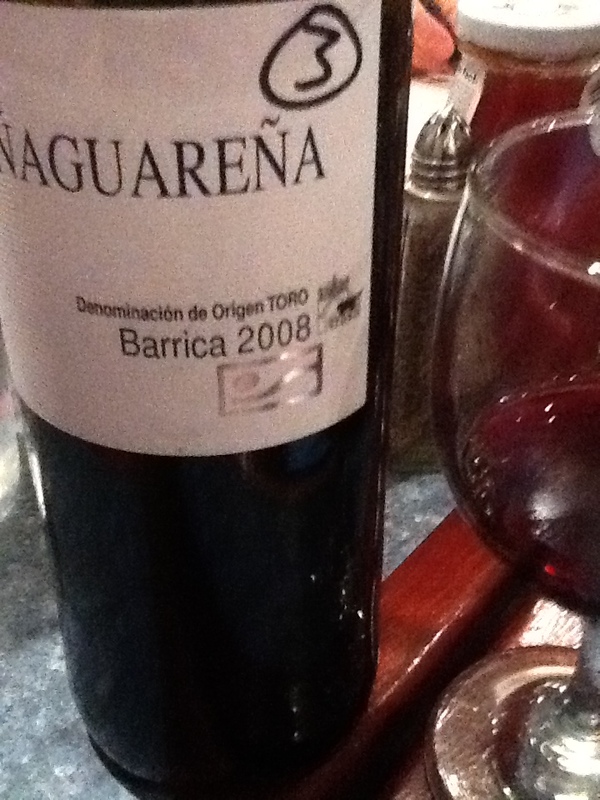 First I got the invite, then the indication of which grape was- tempranillo! Then, the location and time. Finally, the day arrived. I fretted about choosing the wine to bring, and settled on a Rioja I picked up from Morrell Wine, which is a shop that has a nice variety and is conveniently close to my current work. I went and looked at their selection of tempranillo wines, narrowed it down to three possible bottles, and then asked a salesperson for help. I showed them my choices, and explained that 1) I was looking for a good value on a great drinking wine, 2) did any of these wines fall into that category, and 3) were there other bottles I should consider? The salesperson was very nice, expressed approval at my choices and described the qualities of two of them they had tasted. 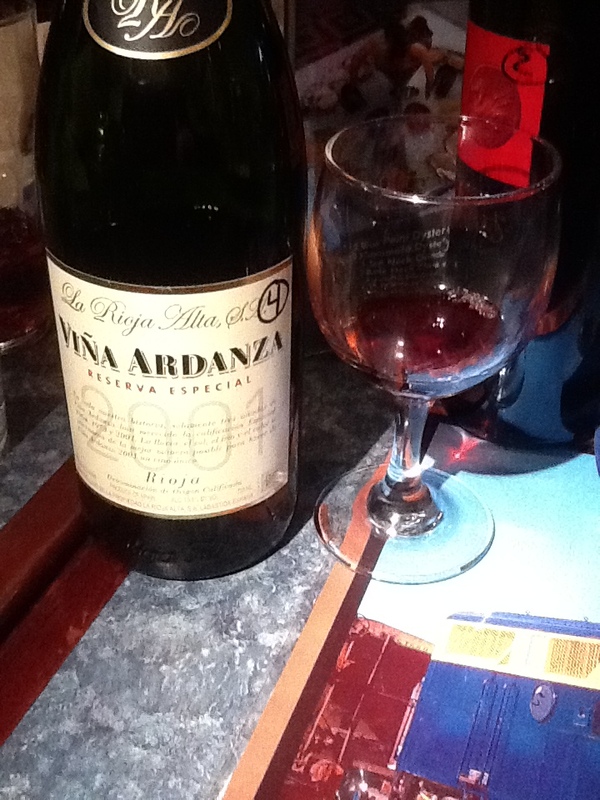 I chose a wine whose name is as much of a mouthful as the wine is itself: La Rioja Alta Vina Ardanza Reserva Rioja Spain 2001. On the shop’s website, this wine boasted a Robert Parker rating of 94 points with a review calling it “medium-bodied, velvety-textured, and already complex” and sounded like a mature wine I’d appreciate that might be very different than what others were bringing. Off I went to the gathering! I arrived at the appointed location and was quickly introduced to those I did not know. As is always a good idea when tasting both to cleanse the palate and assist the body’s ability to process wine, we got some food and water along with our wine glasses and then opened the bottles one at a time to taste. Yes, just to taste, as in sample, not drink! There were five bottles in total, each of a different vineyard, and varying vintages. What fun! We poured a sample, passed the bottle, looked in the glass at color, smelled the bouquet, tasted, and shared our thoughts openly. It was great fun to attend a tasting when you have no clue where the bottle came from, who bought it or what it cost, and no pressure to buy the wine, or to even enjoy it! A couple of sips and some discussion, and we were on to the next wine. I have to admit that it was even more fun not knowing what kind of stores these were from, or the price range. Everyone had their own personal reactions, some people dumped glasses quickly, others sipped delicately, thoughtfully. No one left drunk or even tipsy. Here’s the list of the wines we tasted, with a tasting note and a link for your enjoyment. I’m including my terrible camera-phone pictures for label reminders. Garnet color with brown edge. Zingy nose with acid and sugar- like a cherry cola, to me indicating possible TCA (aka trichloroanisole, or cork taint). Very fruit forward, overly ripe cherry on the palate– but seems the wine is tainted or at least, turning, possible in the bottle from lack of temperature control. Overall, this was our least favorite wine. $17/bottle. Garnet color, nose of cherry, red plum and a distinct odor of dill. In the mouth, the cherry and plum still mix together with black plum, spicy pepper, black cassis and a long finish with oak, spice box, a hint of smoky mint- perhaps cardomom. 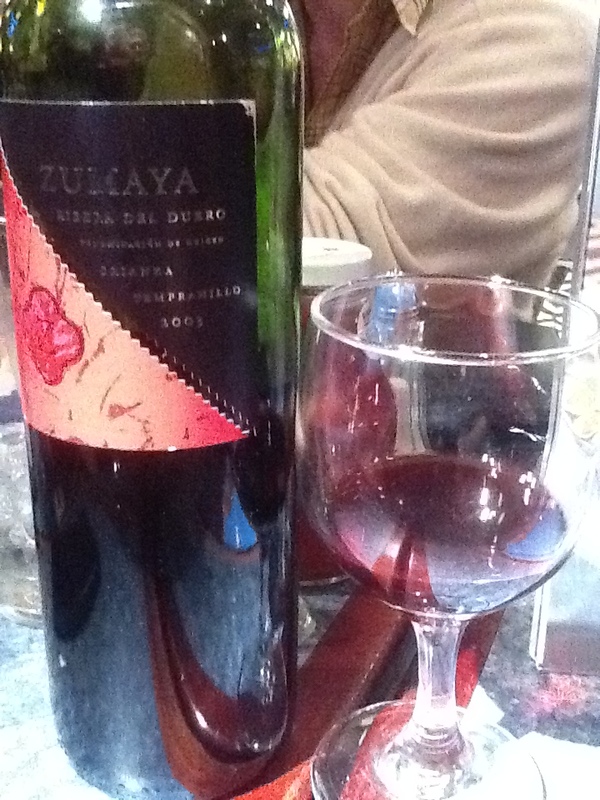 This wine does show differently than the others due to age (and the flaw in the Zumaya wine being turned) $32/bottle from Morrell, as low as $25/bottle online. Of the five wines, I personally enjoyed #4 and #5 the most, but I do wonder if it was partially my palate and the process of tasting the three wines prior to #4 that assisted in that development. No matter, as I truly had a great time- this was a lovely evening and I felt honored to be brought into this group of like-minded people who all enjoyed the method of tasting and discussing without drinking to excess on an early work night. If I didn’t work most evenings, I’d want to set up an evening like this in my neighborhood, and I highly suggest that you try this with friends. The idea of tasting several bottles of a specific type of grape makes for a lot of fun, as well as being educational. It gently takes people away from their comfort zones into a playful area of exploration with no pressure to buy anything or answer to anyone in a safe environment. To me, the enormous success of this evening proves that Jimmy chose the name accurately. With a nose of cassis and cherry and a nice purple color, this Portuguese red has plum as the dominant fruit when tasted. Secondary notes of leather and cedar accompany the nice balance of the Touriga Franca grapes; and it has an even, medium dry finish I found delightful. I had two bottles of this wine and enjoyed it over two weeks with steak, salmon, chicken, even pizza -and found this a nice vin du table I’d serve with just about anything. I was surprised that when I googled this wine, I only found it at Astor Wine- I’d expect others to jump on this bargain immediately! I’m considering both getting a case, or a mixed case of this and the white from Cepa Pura (see my link below). Here is a link to the winery Quinto do Montalto for your enjoyment! If you click an English link that does not work, try it in French or Spanish! In the meantime, I happily suggest Astor’s Top Ten Under $10. Both of the wines from Quinto Do Montalto were from this set which is a great introduction to great bargains from around the world. 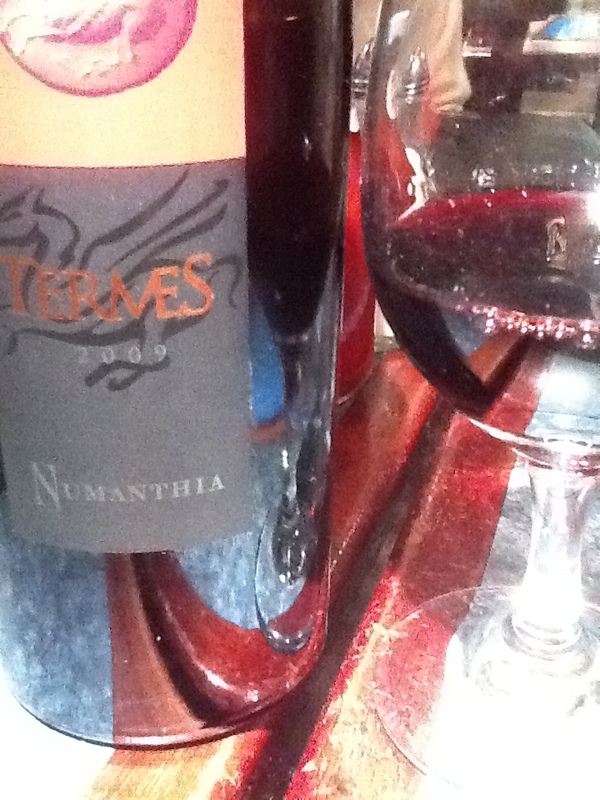 (Here’s the link to the Fernao Pires I reviewed, and another for the McManis Family Syrah!) I’ve been very happy with the selections I’ve purchased from Astor Wine & Spirits and think this inexpensive case of wine is a great way to get to know new wines- you can even see what’s in the group in advance. If you decide to try one, let me know what you think! I bought a case in November (it changes every month!) and it is accompanied by a descriptive sheet which I enjoyed reading for pairing suggestions. I really enjoy this wine store and have found several wonderful, rare wines that are available here. I think Astor’s Top Ten Under $10 is the perfect complement to Sherry Lehman’s Unsung Heroes of Bordeaux, which is another one of my favorite ways to taste new, small, or unknown Chateaux. These wines change twice yearly, and both of these sets make excellent gifts to your oenophile friends! I’m playing with the idea of forming the brand name of Tangent Whines. I like it better than The Bloggy Doldrums, which has a nice ring but just sounds too depressing. “What,” you are wondering to yourself, “is a tangent whine?” Good question! A tangent whine is when I complain about going off on a tangent. For example, when lecturing, I try to refrain from going off on a tangent. It’s one of the things that a) my professors in grad school demonstrated well, b) wasted good class time, and c) was usually fun, informative, and intrinsically educational though often unrelated to the topic at hand – voila! – A tangent. Did you see we just had one? Right, it is just that easy to do. 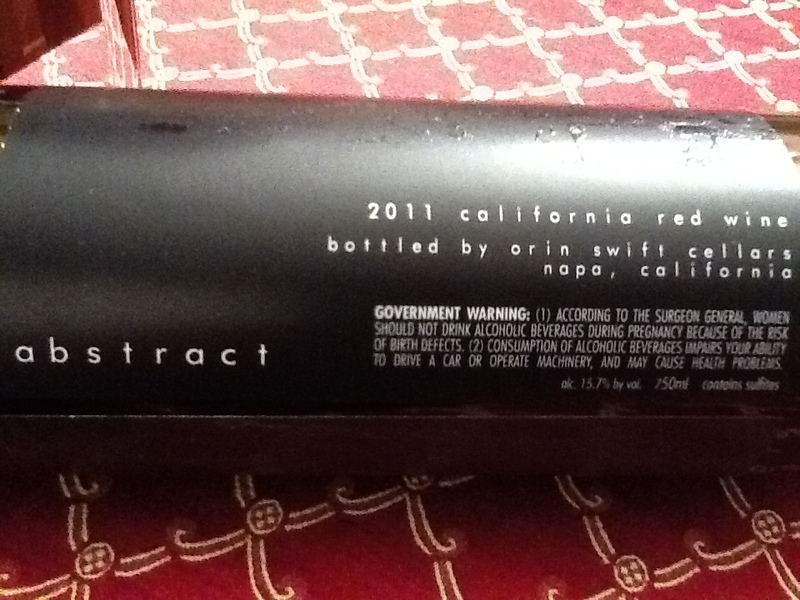 Just for the record, I’m not talking about the nice wines made from Tangent Winery in California. But, while I’m on the topic of wine and not whine, I should point out that I have also experienced other tangent wines. These Tangent wines (without the H) are the wines that pop up in your life, interrupt your plans and change what you’re imbibing – as opposed to what you INTENDED to imbibe – much like the tangent in a conversation that pulls your focus away from what you intended to discuss. Over the recent holiday, I caught a cold. With an occluded palate, I could not enjoy several wines I had planned to taste and review. Additionally I was unable to imbibe alcohol due to a medication I was taking to help fight the cold, and honestly, I really wasn’t even in the mood for anything but hot tea. Having since recovered from my cold, I have several wines that are still awaiting my tasting notes. I have in the meantime, tasted other (tangent) wines, but not always felt they were wines I wanted to review. And my cellar is full of great wines waiting on me, and some lesser wines as well. With all these elements in play, I’ve been in a kind of wine holding pattern as a result. In the writing process, every great story has parts that get cut. The good thing is, there is usually an editor who keeps your story on track, sees when a writer has lost their focus, or drifted off on a tangent, like that one. Today is my tangent whine, and I’m regaining my focus, and explaining why I’ve not blogged in the last week- I was away on a tangent! 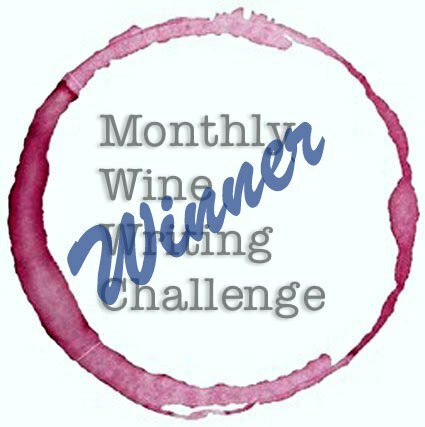 But I’m done with my bloggy doldrums, I’m ready to get back to really tasting, smelling, and focusing on enjoying wine again, and sharing it with you. My whine is over, my rant is done. Let’s taste some wines, shall we?